MeowMultiSound 1.01 is audio encoders/decoders software developed by Meow-prod. MeowMultiSound is a free sound converter that supports mp3, wav and ogg sound files. It allows to convert files in both direction. For example you can convert wav to mp3 and mp3 to wav. You can convert aswell from a wav file to an other wav file with other specifications. Features drag and drop support and an option to generate Id3v1 tags common to several files. 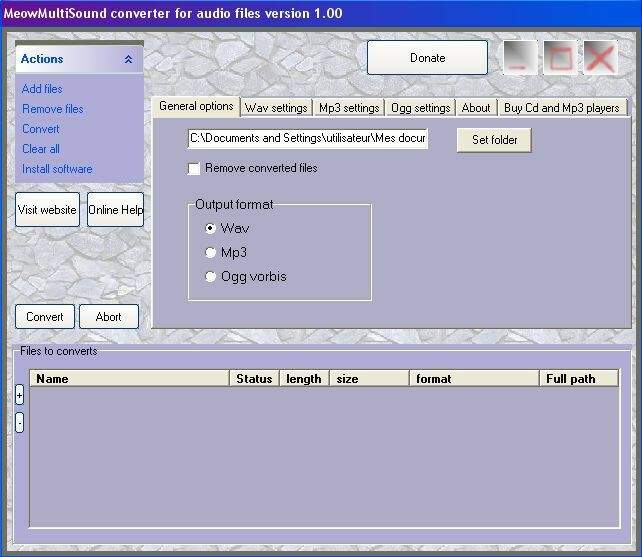 This audio encoders/decoders software is freeware, which means you can download and use MeowMultiSound 1.01 absolutely free. There's no need to buy the product. MeowMultiSound 1.01 supports different languages (including English). It works with Windows 98/XP/Vista. Latest MeowMultiSound 1.01 does not contain any spyware and/or advertise modules, allowing installing it with no worries concerning valuable information loss. Our website has thoroughly tested audio & multimedia product MeowMultiSound 1.01, written the review and uploaded installation file (1182K) to our fast server. Downloading MeowMultiSound 1.01 will take minute if you use fast ADSL connection. Switch sound file conversion software is an audio file format converter. MPegger Drop Decodercan automatically convert any MPEG-1 or MPEG-2 LSF layer 1, layer 2 or layer 3 audio file into an AIFF file, Sound Designer II file, or PeeCee Wave file.